Even before I entered my second Grand Tournament I was already thinking about my third. Thinking about an army for a Grand Tournament is easier than assembling the army for the Grand Tournament. For my third army I wanted to go real shooty but still Nurgle. I wanted to increase my model count but maintain a high standard of painting. I wanted some new conversions but I also planned to use some of my existing models too. Even choosing the army list is an agonizing process. I've come up with at least a half dozen slightly different army lists. Most share certain models and units many of which I've already bought and converted. I held off posting anything about it on the web because I don't like the thought someone would steal my ideas while I was in Japan. And I like to have some new photos to add when I do a major update to my website. Now when I finally got most things settled new rules are coming out. I had always hoped to get the army painted sooner than the previous two Grand Tournaments to allow for play testing and revision, but now the army was chosen using assumptions based on a soon to be obsolete rule set. Although I like Heavy Support and Nurgle needs Heavy Support in order to have guns that shoot over 24". In an effort to improve my army selection score I'm trying to limit myself to two Heavy Support choices. One of these will be a new Dreadnought I've dubbed "Blast Marker Billy" the other will be a new one gun predator. Another source for Nurgle, of guns that shoot over 24", is Chosen. So I want to take a squad of Terminators. I thought of taking 9 with 3 Reapers but I will probably end up with seven giving me two reapers and a free champion. My general will have a Kai Gun. No one seems to be doing it so it must not be that good. I want to do it as having the lord be shooty will help me stay focused and not run across the board and get into H2H. All the models needed above have been bought some have even been converted. None of them are ready for their debut online or on the battlefield. While in Japan I did paint up ten Plaguebearers and ten Plague marines. These models will likely be used as part of my Troop allotment. They can be seen below as photographed on the pool table, hence the soft green background. Although I was tempted to leave Plaguebearers out of my army list because they can't shoot I plan to include a unit for two reasons. First for variety I was once told that variety can increase your army selection score. And second because they are cheaper than Plague Marines. With planning to take two Heavy Support choices and a squad of terminators, in order to keep my model count up I need some cheaper troops. There are exactly seven blue plaguebearers now in my miniature collection this is likely the squad I'll use in the army. I painted up ten more Purple Plague Marines armed with bolters in two batches. The first batch did not use the Gorka Morka influence dry brushed metal technique before the armor base coat the second batch did. Ultimately they will end up in the same squad. This squad will be 20 Plague Marines strong all with bolters or Plasma Guns. I think this legal but unused horde style squad will cause difficulties for my opponents. An opponent will need to kill 11 Plague Marines to collect any victory points under standard scoring but in missions where you are limited to deploying one or two troop choices at the start of the game is where I think it'll prove the biggest shock. It's true over several games shots will be wasted as 18 bolters and two Plasma Guns is overkill for a target. But overkill implies that the target was destroyed so you can't complain too much about that. Although not officially his retinue, my lord will usually be deployed with Syphilis Squad giving the squad 21 models, three times Nurgle's sacred number. Legally they could be Chosen which would also allow you to field the squad with six plasma guns!. Although legal this would likely prove unpopular with your opponent. In addition to the 20 model strong squad I plan to have at least one Plague Marine squad in a rhino and I still haven't given up on the idea of infiltrating Plague Marines. In general I plan to make more use out of Chaos rewards and veteran skills than I did in Vancouver. Also I plan to give Nurgle's Rot to all my characters including all my aspiring champions. 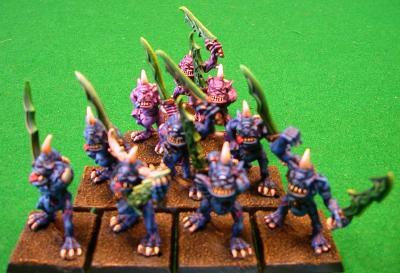 Even without Nurglings I should be able to have over 50 models in my army. My Vancouver Army list had 47 while in Calgary I had 56. I believe I can sacrifice an Aspiring Champion or a bunch of wargear to get a squad of Nurglings so I could field a larger army but I think a Terminator Aspiring Champion will kill more than 6-7 Nurgling stands. One day I want to try to field a true Horde army with lots of Nurglings and Plague Marines and little or no Heavy Support or Elites. Read the Battle Report of my first game in 18 months.